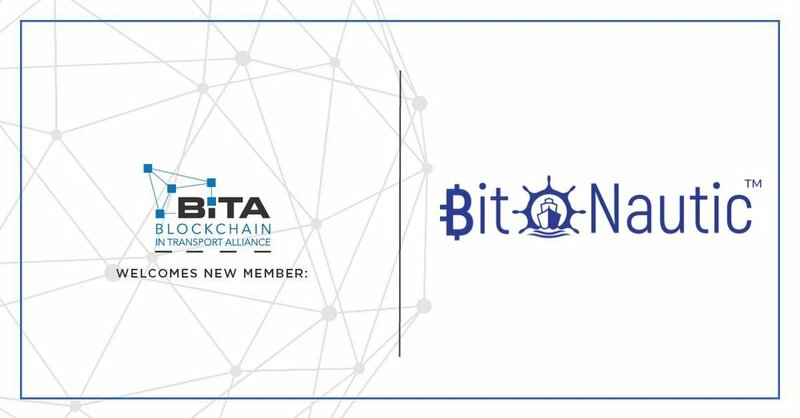 BitNautic, an all-in-one hub for the global trade industry, has joined the Blockchain in Transport Alliance (BiTA), an organization dedicated to determining best practices and standards relating to blockchain in the transportation/logistics/supply chain marketplace. Blockchain can help companies in the transportation, logistics and freight marketplaces digitally identify and track transactions, contracts and shipments as part of a distributed ledger system, making operations more transparent and reliable. Blockchain can help organizations improve customer experiences and create new revenue streams by improving fleet management and other areas. BitNautic has an all-in-one solution for all industry players, which allows shippers to book transport for their cargo – choosing and combining the best carriers in terms of price, speed and carrier reputation, based on real users’ experiences. The platform takes advantage of the blockchain, allowing full supply chain transparency, secure digital management of data and documentation, safe payments without the need of third-party approval, and much more. Founded in 2018 and based in Switzerland, BitNautic has successfully concluded its ICO reaching Hard Cap, selling over 30 million BitNautic Tokens (BTNT), and is en route to becoming one of the most influent enterprises in the space, with a working MVP already online and accessible to all BitNautic customers. BitNautic has a decentralized platform, based on the Ethereum Blockchain, for matching demand and supply of shipping services, for all industry stakeholders: freight forwarders, charterers, carriers, importers and exporters. BitNautic comes with distinctive features like an extensive document management system, real-time tracking of ships and cargo, and a wholesale e-commerce platform. Founded in August 2017, BiTA has quickly grown into the largest commercial blockchain alliance in the world, with nearly 500 members that collectively generate over $1 trillion in revenue annually. BiTA members are primarily from the freight, transportation, logistics and affiliated industries. Alliance members share a common mission to develop a standards framework, educate the market on blockchain applications and encourage the use of those applications. BiTA has offices in: Chattanooga, Tennessee (USA); Sydney, Australia (Asia-Pacific Region) and London (European Region). For more information, please visit www.bita.studio/.